Stained Concrete Modernizes an Outdoor Living Space Project submitted by Andy Espinoza, Envision Concrete, Escondido, Calif. Concrete Fire Pit Is Shaped to Impress Project submitted by Chris Frazer, DC Custom Concrete, San Diego, Calif.
Cantilevered Countertop Takes Outdoor Grilling to New Extremes Project submitted by Gregory Hryniewicz, Hyde Concrete, Annapolis, Md. Concrete Patio Is Designed for Outdoor Entertaining Project completed by Greystone Masonry, Stafford, Va. 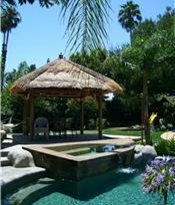 Concrete Patio and Fire Pit Replicate Travertine Allen Ortiz, Allen Decorative Concrete, Escondido, Calif. Concrete and Tile Transform a Backyard Patio Mike Davidson, Opus Stone, Tustin, Calif.
Contractor’s flare for outdoor fire feature design ignites a new business Living Stone Concrete Design, Oakdale, Minn. Contractor Uses Decorative Aggregate and Stone to Transform a Concrete Patio Visions Below, Laguna Niguel, Calif. Concrete Goes Back to the Ranch Robert Salinas, Stamped Artistry, Pasadena, Texas. Concrete Countertops Used in Ultimate Outdoor Living Space Concrete-N-Counters in Tampa, FL. 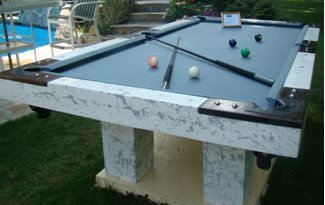 Concrete Pool Tables Are the Latest Craze in Outdoor Recreation Concrete Atelier, New York. 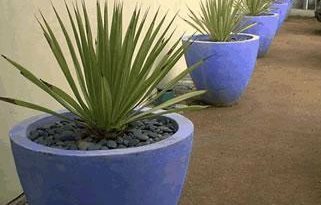 Creating Backyard Adventures with Concrete The Green Scene in Chatsworth, CA. 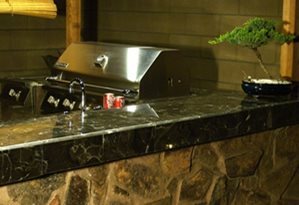 Complete Outdoor Kitchen Turns a Backyard into a Great Place to Entertain Century 22 Creations. 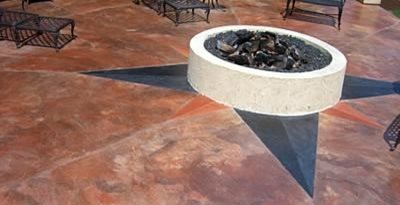 Stamped and Colored Firepit Enhances Backyard's Atmosphere Concrete Impressions in Richland, MI.